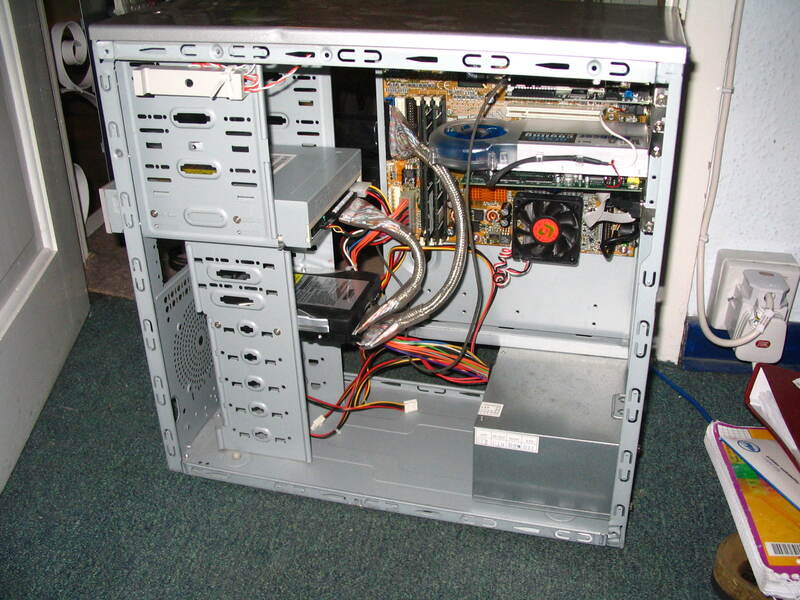 Mod Squad Project 1: How to convert an ATX case into a BTX case. The first installment of many projects to come. The Mod Squad proudly present you with their first 'How to' guide, performed and written by our very own Favu. A mod that many of you will find useful, Favu explains how one can convert an ATX case into a BTX case, making life slightly easier for those who have BTX motherboards. So, without further delay, I present you with Favu! There are many reasons for wanting to do this type of modification - it lets you drop the CPU from the top of the case, which is usually hotter, as hot air rises, and it also turns your GFX card the "right way" up, so that you can see that amazing logo on the heatsink. 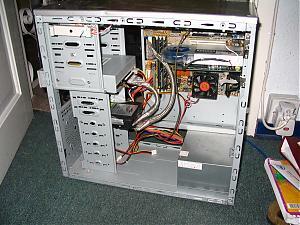 A "true" BTX case will retain the power supply at the top of the case, with just the CPU right at the bottom. This is better, but when starting out with a standard ATX case, it is a lot more work. I haven't actually had the oppertunity to finish this case off yet, as it was pressed into service for my brother's retro Celeron rig. However I will show you the basics, in the hope that you can use this as a base for other modifications, like windows, painting and such. The first step is to disassemble your ATX case until you just have the chassis, without the side panels. At this point you should note how the top and bottom panels fit together, as you will have to undo them. If you are lucky, your case will be screwed together, if you are normal, you will have rivets (which you can drill out), and if you are unlucky it is just one single bent piece of metal (in which case you should give up ). Next, you can remove the top and adjourn to the workbench. Now, remove the rear panel from the bottom panel of the case, for me I did this by drilling out the rivets that held it in place (if you have screws you have to undo them). I also de-riveted the support bar that holds the motherboard plate in place, and took the motherboard plate off (it was removable) this made it easier to see how things would line up. Once you have done this, take the back panel, and turn it so that it is 180* to what it was before. Then you can reattach it to the bottom plate. For me this caused some issues, as the mounting holes for top and bottom plates where not in the same place, so I had to drill out extra holes in the case, to rivet them together At this point you should also reattach the motherboard support arm. Once you have riveted or screwed the back panel back on, you can put the top back on too, in my case I had to drill some more extra holes, to get the screws in. You should find that the side panels fit perfectly, as both the top and bottom plates are in the same positions they where to start with. Nicely done, front page in fact! Thanks Guys! Very nice work indeed. Is that the only cam that you have? Looks like a mobile phone camera. Heh, yeah, admittedly, the picture quality isn't the best, but it doesn't really matter, as there was no real detail that had to be shown in the picture, just the overall case. I must apologise for the quality of the pictures - when I did this I only had my camera phone to work with. Very well done Favu !!! I bet your computer is more stable now !!! Just wondering, I was going to send ya something if you didn't. Better send it to someone more needy, though. how do you get the rivets out? and you just use shrews to put in place of the rivets when your done? I have a battery powered pop rivet gun. i'm gonna think about this for a few day then deside if i'm gonna do it. it seens sort of hard. Thought I would re-awaken this thread because I'm thinking of trying to convert an ATX case into a BTX case. 1. Do the screw holes line up with both ATX & BTX, or do you have to install more mobo screws and standoffs? 2. Was there any problems with the expansion bay & in/out panel lining up with your expansion cards? Did you have to adjust where the motherboard sits to make them line up? 3. Were the holes in the chassi backwards for sliding the sidepanel on cause problems with the panels? Thats it for now.... I'm mostly curious about the motherboard holes matching because if I have to drill new holes that line up with the motherboard, then I probably won't even try this mod. That seems like extremely hard work. Your board is an actual BTX board. Not just a case that installs the board upside down? To check standoffs, just set the board in the case and see if they line up. With your skills, this entire project should be pretty easy for you. thanks for the compliments Samuknow!